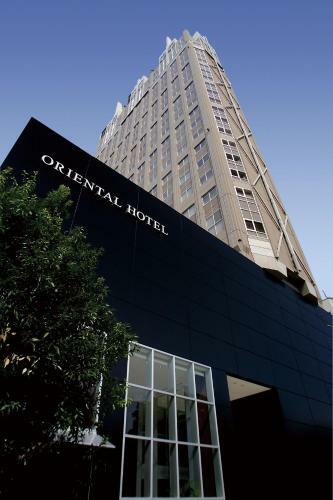 Lock in a great price for Oriental Hotel Hiroshima – rated 8.1 by recent guests! Great location and service. Parking lot staff are great. The hotel staff was very friendly, the room stylish and comfortable, and the location excellent and convenient to the sites we wanted to see. This was a great hotel - excellent service and facilities and very close to restaurants and the main attractions of Hiroshima. We hired e-bikes from nearby which meant we were able to see everything we had come to look at with a day comfortably. We enjoyed the size, the height and the view of the room number 1603. Great value for money! This is a nice 4-star hotel with a cozy room, well-stocked amenities, high-rise views, and an accommodating staff. The location is very walkable from several bus stops. Nice big room even with free mobile phone that can surf and make call. I enjoyed the jazz music that played in the rooms the most. The hotel was in a great location. It was a short walk to the Peace Park and many restaurants. We were able to fit a family of 4 into 1 hotel room which is not often possible in Japan. The beds were very comfortable. Our room was on the 20th floor so we had a great view of the city. Oriental Hotel Hiroshima This rating is a reflection of how the property compares to the industry standard when it comes to price, facilities and services available. It's based on a self-evaluation by the property. Use this rating to help choose your stay! Boasting international cuisines and views of Hiroshima, Oriental Hotel Hiroshima is a 10-minute drive from JR Hiroshima Train Station. It features a beauty salon, stylish rooms and free Wi-Fi throughout the property. An in-room massage can be arranged. Rooms at the Hiroshima Hotel Oriental include an private bathroom with original bath amenities. Guests can wear the provided night wear and enjoy watching the satellite flat-screen TV. Peace Memorial Park is a 20-minute walk away. Hiroshima Castle and Hiroshima Baseball Stadium (Mazda Stadium) are both a 10-minute taxi ride from the hotel. Guests at the Hiroshima Oriental can check their email at the business center, relax with a massage or get a new hairdo at the beauty salon. Mitsuki Restaurant serves seasonal Japanese dishes with beautiful 22nd-story views. Restaurant Ozawa offers authentic French cuisine in a relaxed yet elegant setting, while New York Cafe offers international dishes in a smooth decor that matches its gentle jazz music. When would you like to stay at Oriental Hotel Hiroshima? Simple room featuring a 55 in wide bed. A complimentary mineral water bottle is provided for each guest. Public parking is available at a location nearby (reservation is not possible) and costs JPY 1500 per day. Simple room featuring a 59 in wide bed. A complimentary mineral water bottle is provided for each guest. This simple room features 2 single beds. A complimentary mineral water bottle is provided for each guest. Spacious rooms on floors 20-21 with city views. Complimentary mineral water, newspaper and a free mini-bar are provided. This room features unique artwork and white-on-wood decor. Includes a glass-wall bathroom and free Wi-Fi. Spacious rooms on floors 20-21 with city views. Complimentary mineral water, newspaper and a free mini-bar are provided. This room features unique artwork and white-on-wood decor. Includes a glass-wall bathroom and Wi-Fi. This triple room has air conditioning and an electric kettle. A complimentary mineral water bottle is provided for each guest. This triple room has air conditioning and a complimentary mineral water bottle is provided for each guest. This single room has a seating area, air conditioning and electric kettle. This double room features a soundproofing, electric kettle and seating area. This twin room has a seating area, electric kettle and flat-screen TV. This twin room has a seating area, air conditioning and soundproofing. This double room features a electric kettle, flat-screen TV and air conditioning. House Rules Oriental Hotel Hiroshima takes special requests – add in the next step! Oriental Hotel Hiroshima accepts these cards and reserves the right to temporarily hold an amount prior to arrival. Please note, the on-site parking requires an additional fee. Please contact the property directly for details. Please note, breakfast for children sleeping in an existing bed is not included in rates with breakfast. Please inform Oriental Hotel Hiroshima of your expected arrival time in advance. You can use the Special Requests box when booking, or contact the property directly using the contact details in your confirmation. Check in time 3.00 PM should have been earlier than that. We tourist come to Osaka sometimes from other cities and need to get refreshed before start Osaka tour. Location and the convenience to check in . Rooms are too small, carpet is dirty. Room was tiny. Heating and cooling didn't work to the point where we were sweating in our rooms in the morning, had to leave the door open to get it cool from the hallway air conditioning. Pillows felt like they were stuffed with straw. Mattress was terrible. The staff members were really helpful and complied to all our requests. The procedures for checking in and out of the hotel went really smooth, thanks to them. The room was extremely spacious and comfortable. The bathroom was amazing. The complementary breakfast was extremely luxurious as well. Air-conditioner is well working and size of the room is large enough. We slept in a little on our first day and hung the do not disturb tag. We changed it to "Please clean room" late in the morning and left for the day, but the room was not cleaned that day and supplies were not replenished. Very nice hotel for the price, in the price range I book, this was by far the nicest place I booked (I didn’t book anything more than $100 a night for a five week holiday all over japan) this was definitely the most lux. It’s very close to a bus that takes you to all the main tourist spots, also a ten minute walk to all the main shopping centres, food and bar district! Rooms are tiny! No more than 8m2 on the 16th fl. Reviews and well shot photos led me to believe the rooms were twice that. Visible black mould on the room air vents. No pool, but worse again; no bar!!! Went to the lobby for a G&T and was told not possible. Strange and disappointing place. No atmosphere, no understanding of what a hotel should be. Breakfast didn’t have that wide a selection. The room was spacious (for Japanese standard), I loved the PJs they provided, its quiet but great location. Great value for money.